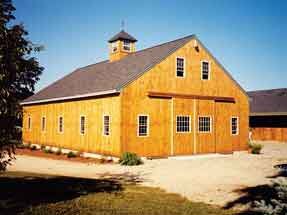 A&B Stall Barns are designed to meet your needs and budget. Decades	of experience help make your barn beautiful and efficient, saving you	time and effort when doing chores. Enjoy more quality time with your horses	in a beautiful new barn! Just call Betsy Bryant at 1 800 267-0506.